When we talk about estrogen to progesterone ratio, we are ultimately talking about the balance between yin and yang energy of your reproductive system. It’s important to know that this ratio is always changing throughout the menstrual cycle; however, when one or the other falls too far out of this fluctuating balance, we see some pretty nasty symptoms. For example, a high estrogen to progesterone ratio (aka estrogen dominance) is one of the most common hormonal imbalances experienced by women. Estrogen in and of itself is not a bad hormone – in fact, no single hormone is bad. However, they do become problematic when they aren’t in perfect balance with each other. Let’s did deeper into this concept of too much estrogen. Whether there’s an absolute excess of estrogen or a relative excess of estrogen, there will likely be symptoms, especially during the pre-menstrual phase of the cycle. Absolute estrogen excess refers to having way too much estrogen circulating in the body. Relative estrogen excess means there’s an adequate amount of estrogen, but too much in relation to progesterone levels (which can be caused by anovulation, chronic stress, or luteal phase defect – click here to read more). The symptoms of each condition may seem very similar in nature, however, the subtle nuances are what differentiate the root cause. Absolute estrogen excess will likely prompt us to improve our detox and elimination processes, while relative estrogen excess will likely prompt us to reduce physical and emotional stress. Do you find yourself with more symptoms in one group versus the other? You’re not alone! Eat organic – Foods that contain hormones, antibiotics, pesticides, herbicides, and insecticides will only add to the burden of our liver detoxification. Eating organic, especially for animal protein, dairy and foods grown with pesticides (dirty dozen), will reduce this burden. Click here for a list of the dirty dozen and clean fifteen. Ramp up Fiber – If we’re not ‘going’ at least once per day, then we may need to shoot for at least 35-45 grams of fiber each day. If we don’t poop every day, excess harmful estrogens and xenoestrogens can be re-absorbed back into the bloodstream through the gut. Not to mention, our gut microbiome can be negatively affected when waste remains in the intestines for longer. Avoid Alcohol – one alcoholic drink has been shown to raise estrogen levels by 10% and it even slows down the body’s ability to burn fat. It’s best to stick to a maximum of 2 drinks per week. If you are at risk for breast cancer, then you may want to consider abstinence. Lower Sugar – Women who have PMS consume 275% more sugar than women who don’t have PMS! Click here to read more. Eat lots of liver-cleansing foods : Dark leafy greens especially dandelion greens, kale, parsley, red beets, sea vegetables, avocado, bok choy, broccoli, brussels sprouts, cabbage (purple), cauliflower, chinese cabbage, turnips, and watercress all provide building blocks for the detoxification pathway in the liver. A liver firing on all cylinders means less circulating estrogens and less PMS for! Drink vegetable juices: consider 10-16oz of green juices/day. Any kind of leafy greens, cucumber, celery, ginger, wheat grass, green apple, carrots, lemon and cayenne are great. Drink Tea: consider trying a prepared herbal detoxification tea containing a mixture of burdock root, dandelion root, ginger root, licorice root, sarsaparilla root, cardamom seed, cinnamon bark and other herbs. Omega-3s: If you don’t eat a diet rich in omega-3s, consider supplementing with essential fatty acids (omega-3 fatty acids). We love Rosita Cod Liver Oil. Fiber Supplements: Consider adding a serving of Metamucil, Pure Encapsulations Nutra Flax, Thorne Research Medibulk, or simply add chia and/or ground flax seeds to your daily smoothies. SGS and DIM: Consider Pure Encapsulations DIM Detox as a comprehensive supplement that supports Phase I and Phase II liver detoxification while also protecting the liver with antioxidants. N-Acetyl cysteine: helps to transform toxic forms of chemicals being eliminated by the liver into less toxic, more execrable forms. We love Pure Encapsulations DIM Detox. Pycnogenol: compound found in grape seeds that support detoxification and circulation. We love Thorne OPC-100. High Quality Multi-Vitamin: We love Thorne Prenatal for women. Extra-Buffered vitamin C: We love Thorne Buffered Vitamin C powder. Magnesium: Consider Magnesium citrate 150-500mg before bed if you are having issues with passing stool each day. Avoid Xenoestrogens – Consider getting rid of toxic cleaning products, toxic personal care and makeup products, and reduce your exposure to BPA – canned foods, plastic water bottles, tupperware, etc. Click here to learn how! Reduce Wheat and Dairy: the proteins gluten and casein found in wheat and dairy products have been show to cause inflammation in the gut, even in perfectly healthy people. Therefore, limiting contact with either is a sure way to keep inflammation, stress, and hormonal imbalance at bay. Sweat regularly – Sweat is an innate detox pathway, so take advantage of it! Just remember that frequency is more important than intensity. Get acupuncture – Acupuncture is effective for addressing PMS, ovulation, and infertility issues. Click here to find a licensed acupuncturist in your area. Manage Stress – High cortisol has been correlated with low progesterone. Click here for ideas on how to decrease stress and increase your self love practice. We cannot properly address low progesterone if we are in a state of chronic stress. Ultimately, you’ll want to discuss any new nutrition or supplement plan with your doctor before beginning. 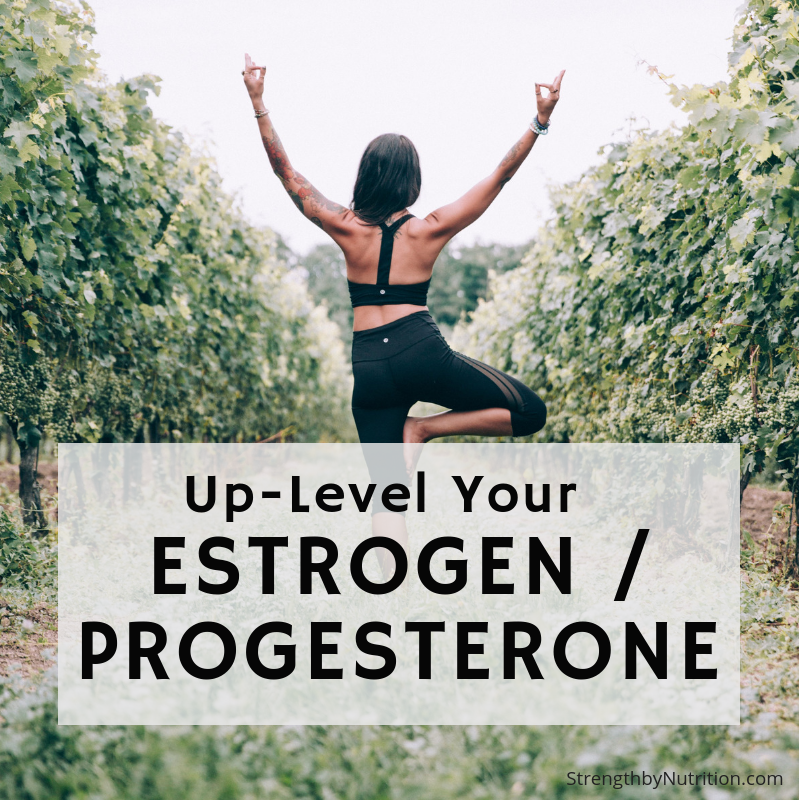 Consider these steps that may help improve estrogen to progesterone balance and, not to mention, feel what it’s like to live life without symptoms! Let us know if you have any questions in the comments below.